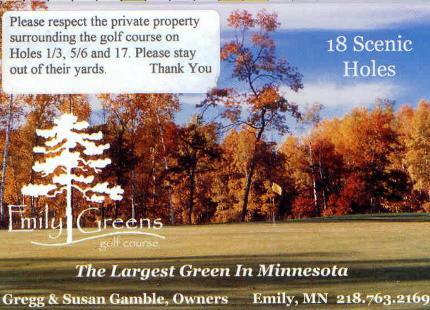 Emily Greens Golf Course is a Public, 18 hole golf facility located in Emily, Minnesota. The facility has two distict 9-hole courses. They are The Executive Nine and The Championship Nine. The Executive Course enables individuals learning the game of golf to step up to a championship-style course when they are ready. 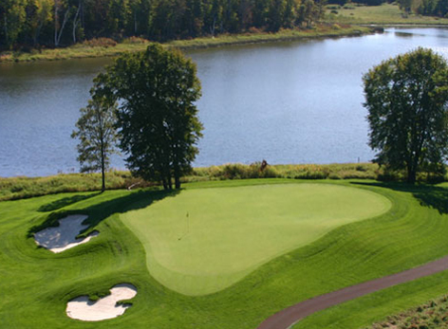 The Championship Course offers challenging golf play for even the most experienced of golfers. Par for the Championship Course is 36. From the back tees the course plays to 3,294 yards. From the foward tees the course plays to 2,687 yards. The longest hole on the course is # 5, a par-5 that plays to 584 yards. The shortest hole on the course is # 2, a par-3 that plays to 146 yards from the back tees. Watch out for # 5, the 584 yard par-4 challenge is the #1 handicap hole on the course. The easiest hole is # 3, a 320 yard par-4.